The metal on Zac Vawter bionic leg gleamed as he climbed 103 floors of Chicago’s iconic Willis Tower, becoming the first person ever to complete the task wearing a mind-controlled prosthetic limb. 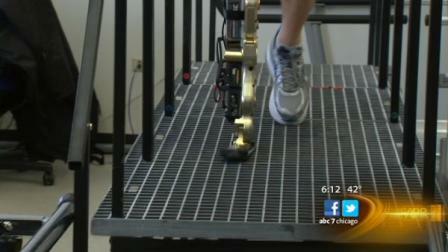 The robotic leg is designed to respond to electrical impulses from muscles in his hamstring. When Vawter thought about climbing the stairs, the motors, belts and chains in his leg synchronized the movements of its ankle and knee. The computerized prosthetic limb, like something one might see in a sci-fi film, weighs about 10 pounds and holds two motors. Bionic – or thought-controlled – prosthetic arms have been available for a few years, thanks to pioneering work done at the Rehabilitation Institute. Knowing leg amputees outnumbering people who’ve lost arms and hands, the Chicago researchers are focusing more on lower limbs. If a bionic hand fails, a person drops a glass of water. If a bionic leg fails, a person falls down stairs. This event was a research project for us, said Joanne Smith, the Rehabilitation Institute’s CEO. “We were testing the leg under extreme conditions. Very few patients who will use the leg in the future will be using it for this purpose. From that perspective, its performance was beyond measure,” Smith added. To prepare for his pioneering climb, Vawter said, he practiced on a small escalator at a gym, while researchers spent months adjusting the technical aspects of the leg to ensure that it would respond to his thoughts. When Vawter goes home to Yelm, Wash., where he lives with his wife and two children, the experimental leg will stay behind in Chicago. Researchers will continue to refine its steering. Taking it to the market is still years away. Nearly, 3,000 climbers participated in the annual charity event, called SkyRise Chicago. Participants climbed about 2,100 steps to the Willis Tower’s SkyDeck level to raise money for the institute’s rehabilitation care and research.